These burning wolves rise above previous infernal origins to become proud members of the Everglow society. Age. Phoenix wolves mature at roughly the same rate as ponies, with a slight 1-2 year variance. Alignment. 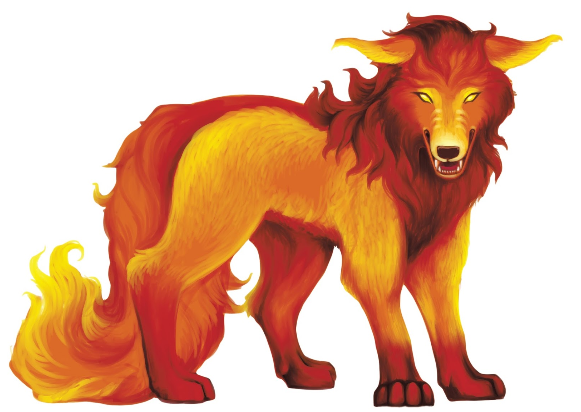 Phoenix wolves tend towards neutral alignments, showing less variation towards good and evil, though they tend to be slightly more lawful than most races. Languages. You can speak, read, and write Common. You can also choose one language from the following list: Sylvan, Elven, Ignan, or Infernal. Fey Born. Phoenix wolves count as fey for all purposes. Ember Eyes. Phoenix wolves have Darkvision 60 ft. Fiery Pelt. You have resistance to fire damage. Bite. You gain a bite as a natural attack that has the finesse property and deals 1d6 piercing damage. Fire Nature. When you cast a spell that deals fire damage, that spell is considered to be cast at one slot higher, and you add +1 to any DC spell saving throw the spell might require. Fire Heart. You learn the dancing lights, prestidigitation and produce flame cantrips. Wisdom is your spellcasting ability for these spells.